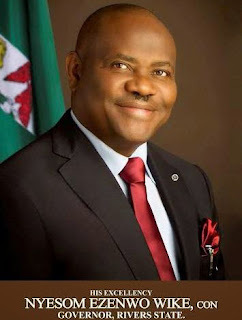 The Rivers State Governor, Nyesom Wike has sacked the Board of Directors of Greater Port Harcourt Authority with immediate effect. In a statement signed by Emma Okah on behalf the state government, it said the former administrator Mrs Aleruchi Cookey-Gam of the Authority has been directed to hand over the administration and all property of the Authority to the Secretary of the Authority with immediate effect. Mrs. Cookey-Gam was former Attorney-General and Commissioner for Justice and Secretary to the State Government, SSG, under former Governor Dr Peter Odili administration. In a related development, the Rivers State government has directed all refuse contractors in the state to return to their areas of work immediately and clean the streets. The contractors are to meet with the State Governor on Wednesday at 10.00am at the Executive Council Chambers, Government House, Port Harcourt. It was learnt that fear has gripped refuse contractors appointed by the immediate past Governor, Chibuike Amaechi because they may be sacked to pave way for loyalists of Wike.